Air conditioning systems are frequently used in designs when minimal changes are required to the existing infrastructure. An air conditioning system uses our vapor compression technology to chill the air within an enclosed environment. The air removes the heat from the payload without need to adapt a cold plate to the existing architecture. 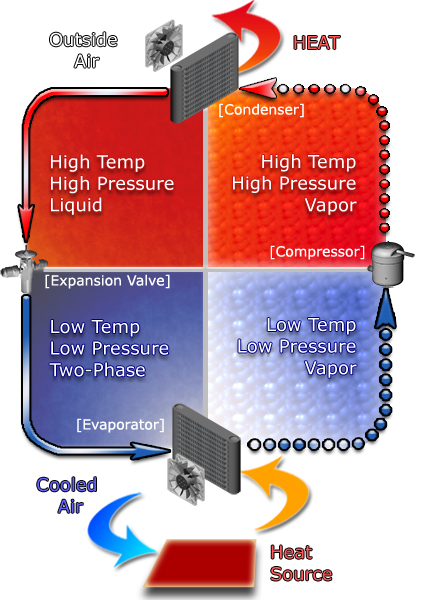 An air conditioning system consists of the basic 4 components of a vapor compression refrigeration system: a compressor, a condenser, an expansion valve, and an evaporator. In an air conditioning system, the evaporator is typically a refrigerant-to-air heat exchanger which removes heat from the recirculating air. Fans are necessary to drive the air flow over the heat exchanger to drive the heat transfer. The figure below demonstrates the details of the vapor compression cycle for an air conditioning system. In addition to cooling, the air conditioning system can also be used to remove moisture (dehumidify) the air internal to a system. Design of an air conditioning system must account for the sensible and latent heat removal as well as handling of the condensed moisture within the system. Aspen has sized and integrated miniature air conditioning systems which meets all of these air conditioning challenges on several products and prototype systems. Examples of such systems can be found below.